Twenty-five thousand feet above terrain he couldn’t see, through thunderstorms of flak and clouds of black smoke, the kid from the Menominee nation in Wisconsin who never wanted to fly found himself smack dab in the middle of history’s greatest conflict, piloting a “tin can with wings,” too busy to be scared. The fear would come later. Down on the ground at the debriefings, where they’d pass around cheap liquor and cigarettes to “help calm you down.” Sometimes the booze and the nicotine worked. Sometimes they didn’t. And when you asked about the plane that had gone orange and whether there was word on the crew more than likely what you got was . . . nothing. There is a thin smile on Fred Jeffers’ 86-year-old face as he remembers things in the living room of his Littleton home. Across the room is Tish, one of his five daughters, who has heard her father’s stories many times, and Tish’s husband Tom Gadbois, who hasn’t heard them nearly enough. Jeffers shrugs. What he did was what he had to do. No big deal. The 22 bombing missions over Germany and occupied France, dropping payload after payload on tank factories, railroad yards, submarine pens and fortified artillery? Just his job. A job he never expected. Someone said the Army Air Corps might be a good idea. Might have been, too, if the Japanese hadn’t bombed Pearl Harbor 10 months later. By dint of his skills as an efficient payroll clerk, Pfc. Jeffers got tabbed for officer training school. By sheer coincidence – the idle hunch of his CO – he became a pilot. Back then you had to learn quick. PT-121, BT-13s, Cessnas – “Bamboo Bombers” they called them. Then into the cockpits of B-24s. Off to England. Learning to fly in formation – “wingtip over wingtip.” Learning not to get spooked by the flak storms and the shrapnel biting into your plane. Hoping to get in 25 missions – your ticket back home. As he talks, Jeffers’ smooth hands become bomber formations, illustrating flight positions, veering in different directions, turning the living room into blue sky. And then he isn’t talking about formations. He’s talking about his plane. All the planes had names. “The Travlin Bag” – that was his. All the planes had pictures of women. Jeffers’ was leggy, with a lot of cleavage and a little valise. Jeffers smiles. The Travlin Bag got him where he had to go and – better still – back to where he’d come from. To base in England. To those briefings where you learned how successful your bomb run had been because you sure couldn’t tell from 25,000 feet up, through clouds of black explosions. 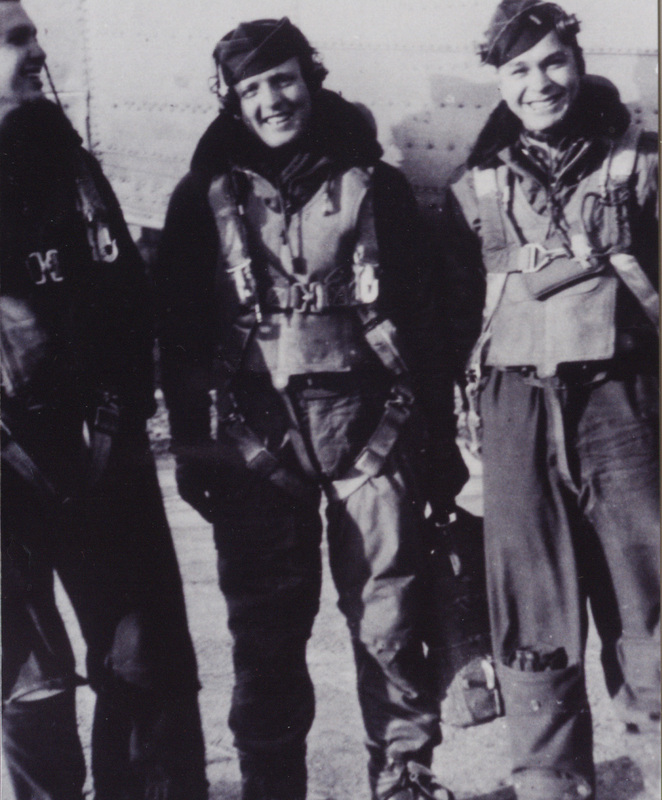 After the war, Jeffers stayed in the Air Corps – it didn’t become the Air Force until 1947 – for another 16 years. Flying the Berlin Airlift. Flying the Cold War. Earning two Distinguished Flying Crosses and 70 other medals. Flying to the rank of major. Along the way he studied the war. Battles, campaigns, dates, details. Important stuff. “We call him the History Channel,” laughs Tish. When she and Tom watch a movie about World War II, they call him up. Y’know, fact checking. He’s glad they ask. People need to know about the war. They should know about a time when brave men who didn’t think they were brave managed to save the world simply because they did what they had to do.